Descaling is not the best thing you can do for your espresso machine and descaling can cause problems with clogged pipes and valves. If you are unsure on how to do this I would recommend sending the machine off to professional services. They would then unmount the boiler(s) and separately descale them with acid. Always use a good water filter to avoid having to descale in the first place. Please follow the below procedure at your own risk. Machine cold and switched off. 1. 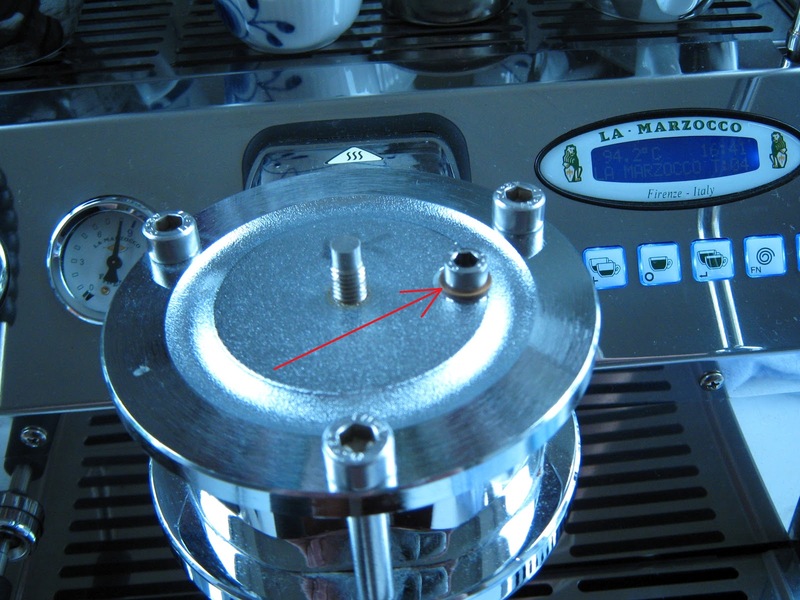 Start by loosening the expansion valve situated in the right side just above the drip tray. Loosen by turning the brass “pipe” counter clockwise. No need to totally unscrew this. 2. 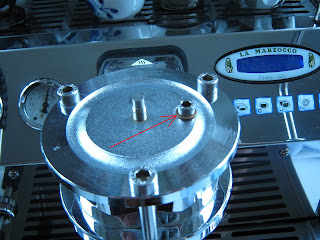 Unscrew the brew head cover and loosen the bleed screw. Now the water should run freely from the brew boiler via the expansion valve into the drip tray. 3. When the brew boiler is drained, tighten the bleed screw and expansion valve again. The expansion valve should not be fastened all the way - see 8. 4. Prepare a descaling solution in a bucket consisting of 3 liters of water and 60 grams of biological citric acid. There should be enough to descale both the brew and steam boiler. 5. Unscrew the left panel. 6. A. If you have a your machine connected to your home water supply then remember to shut off the water beforehand. 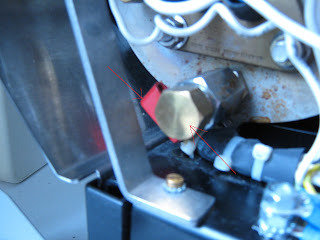 Disconnect the machines inlet hose from from your water filter. 6. B. If you are using the machines integrated water reservoir, unscrew the silicon hose from the pump and attach the stainless steel braided inlet hose that came with the GS/3. 8. Stop the pump when the descale solution starts flowing from the brew head. Loosen the bleed screw carefully and activate the pump. When the water starts leaking from under the screw head, tighten the bleed screw. While the machine is warming up, the pressure within the brew boiler will increase and this is where the expansion valve must ensure the pressure does not exceed 12 BAR. 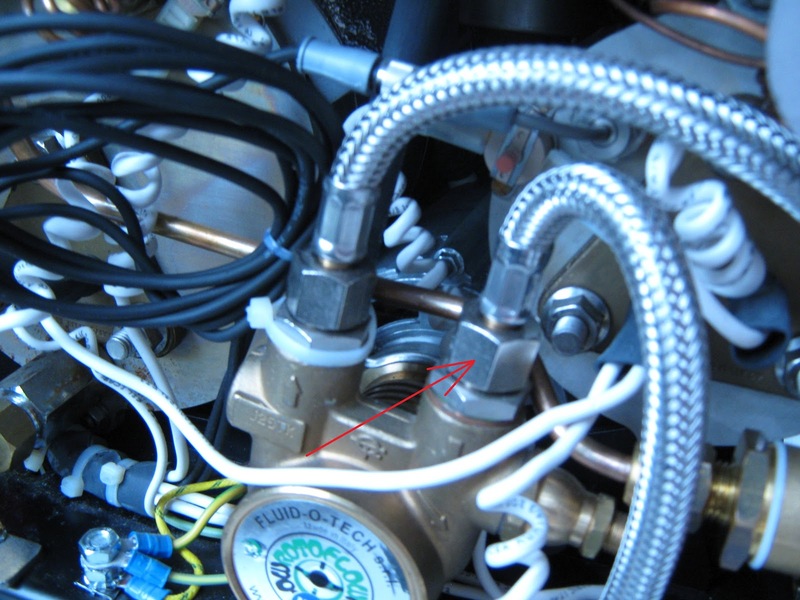 The expansion valve must therefore be tightened (or loosened) until the pressure gage shows 12 BAR or just below. Turn off the machine again. 9. Drain the steam boiler using the inlet hose (unscrew from pump) or other available hose that fits. Mount the hose on the drain pipe and open the ball valve to drain the steam boiler. 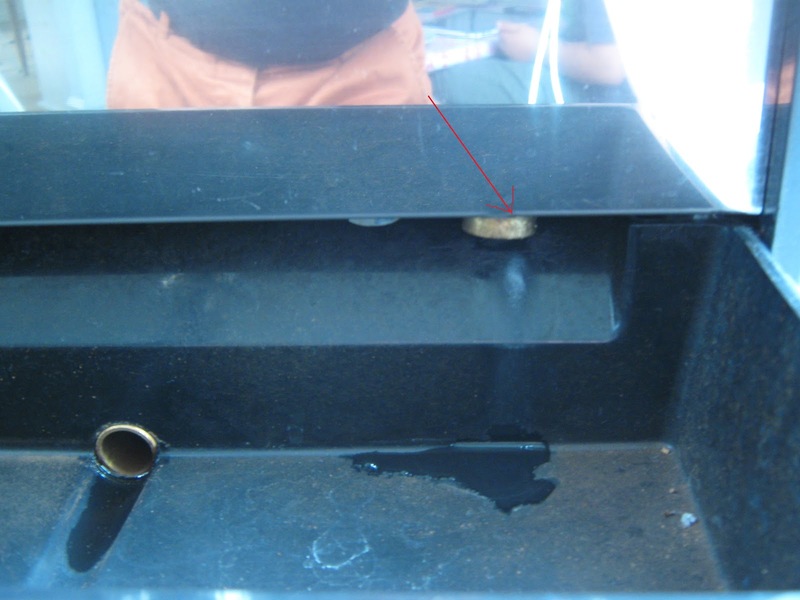 Be careful not to scold yourself and avoid water running into the brain box underneath the steam boiler. 10. Once the steam boiler is drained, shut the ball valve and unscrew the drain hose. The inlet hose is then reattached to the pump (if ever unmounted) and the other end is placed in the bucket with descaler. Turn on the machine. The pump will start auto-filling the steam boiler now using the descale solution. Let the machine warm up as normal and let it descale 60-90 minutes. Optionally run some water/descaler through the steam wand and hot water wand. 11. Now flush the brew and steam boilers using the same procedure as above by draining and flushing the boilers with fresh water 3-4 times. Taste the water from the steam boiler to determine whether it should be flushed further. Taste the water from the brew boiler and continue running water through the brew head until the water no longer tastes sour.